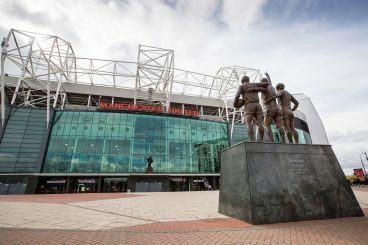 TSA’s 39th Annual General Meeting was held at Old Trafford, the home of Manchester United on 3rd April 2019. This was the best attended TSA AGM yet and due, in no small part, to the fact that it marked the moment when Rory Stanbridge stepped down as Secretary General. Rory had served for 13 years in this post, having previously completed 12 years on the ‘other side’ as a Council member, including a term as President. Adam Bradley, current TSA President, led the tributes and presented Rory with a special glass trophy as a lifetime achievement award. 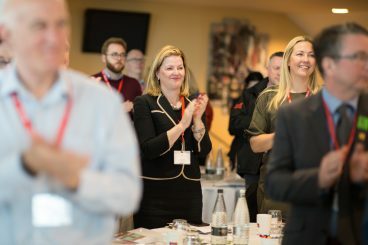 Rachel Tyrrell, incoming Secretary General, gave a speech which highlighted the combination of strong opinions allied with a genuine interest in people which ensured that Rory forged a huge network across the surveying profession over many years. She presented Rory with a framed ‘Last Line up’ photo of the Busby Babes, signed by five surviving members of that team. 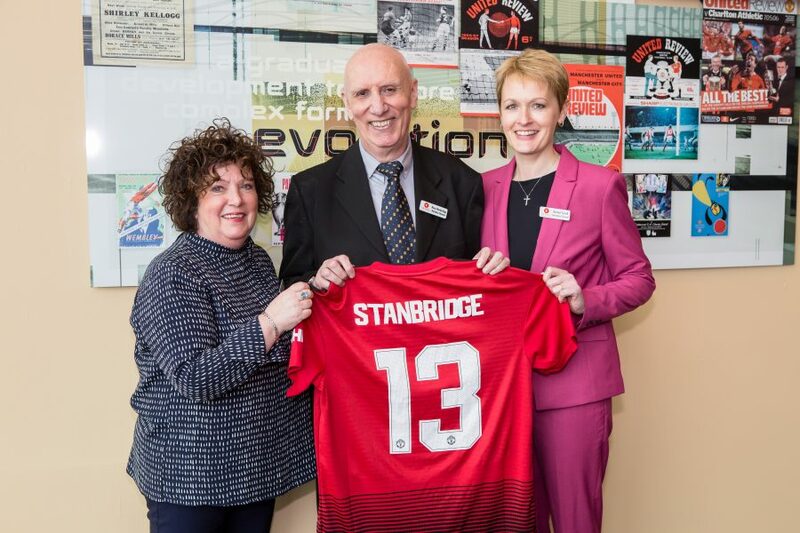 Manchester United kindly donated a personalised home shirt for one of their biggest fans. A very special survey-related gift was organised by Dave Bennett (Topcon Positioning), John Fraser (Leica Geosystems) and Ian Pennington (Trimble). It was a mirror stereoscope, to acknowledge Rory’s roots as a photogrammetrist. As a final touch, the instrument was accompanied by stereo images of Old Trafford. The entire room then stood to give Rory a well-deserved standing ovation. The actual business of the AGM was presided over by TSA President Adam Bradley, beginning his third year in office, along with Nick Hampson as Vice-President who was also re-elected. The newly elected Council was announced: Adam Bradley, Nick Hampson, Graham Mills, Stuart Dimond, Olly Viney, Adrian Halliwell, Tony Rogers, Nathan Spencer, Sam Roberts, Mike Hopkins and newly co-opted Luke Steadman. David Watterston had stood down from Council after serving eight years. Adam Bradley presented David with the President’s Award in recognition of his significant contribution to TSA as a Council member for eight years and the positive impact this has had on the Geospatial Profession. David has achieved the rare honour of serving on all three TSA Committees (MIA, PR and Technical) during his time on Council. 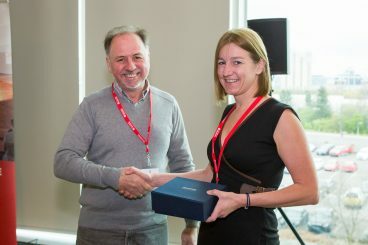 In addition to the trophy, which was presented by Emma Poole from Lockton, a donation of £100 will be made to Great Ormond Street Hospital. The AGM then officially closed and the rest of the day was filled with the usual variety of presentations. First up was Mark Lawton, Chief Engineering Surveyor at Skanska Infrastructure, who spoke on using new technologies which are changing the way we survey, record and make sites safer. Mark urged all attendees to push the Geospatial Commission to commit to a national feature code library. Nathan Spencer, a TSA Council member and Survey School Governor, then gave an update on The Survey School. Nathan covered the variety of short courses, continual search for tutors, success of the Level 3 Diploma and the two-year TSA Surveying Course which has been training new surveyors for 18 years. 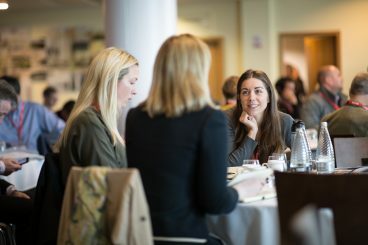 Following the superb work achieved by Ruth Adams during her time as Survey School Manager, we are now looking for someone else to take on this role as Ruth’s contract ended in February. 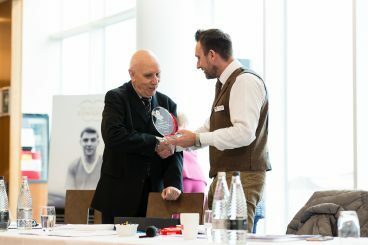 Continuing the theme of training and education, Stuart Edwards of Newcastle University spoke about the need for ‘unification and not competition’ in the work to promote surveying as a career. TSA is one of the early founder sponsors of this revitalised initiative, following in the footsteps of Geomatics.org from many years ago. We couldn’t avoid the ‘B’ word any longer, so up stepped Alex Briggs of MHP Communications to provide an overview of the turbulent political landscape. An overview of where Parliament currently is was given, along with the six main ‘likely’ options going forward. Alex was candid about the truly uncharted waters that the UK is currently in and the knock-on effect that Brexit is having on every area of Westminster business. 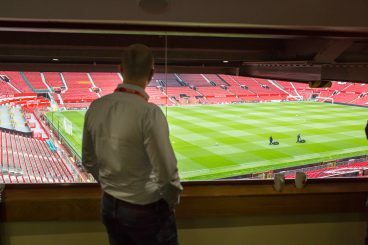 After such a full morning, Members then had the opportunity to enjoy a wonderful two course lunch, along with views of the Old Trafford pitch (although for the Liverpool fans present the equally impressive views of the Manchester skyline proved a more palatable option). The afternoon session kicked off with a presentation given by David Powell via Skype, picking up on the discussion that Members had in November on the subject of Boundaries and the need for a Cadastre in the UK. David spoke about his belief that a cadastre is a failed 20th Century concept and outlined the reasons, economic and legal, as to why this idea is a non-starter. He was able to take questions from the room and encouraged TSA members to contact their local Law Society branch and offer to give a talk on what land surveyors can actually do. The final presentation was given by Dr John Gullick from Thames Tideway, on the history and delivery of a £5bn Super Sewer. John provided a wonderful history lesson, beginning with the old rivers of London and how they were the original sewers. The subsequent expansion of London led to a truly dire level of pollution. The ‘Great Stink’ of 1858 forced the Victorians to start constructing some major sewers, some of which are still the backbone of the system today. However, in 2000 the Thames Tideway Strategic Study Group was commissioned, and a full-length tunnel solution was selected by Government as the most timely and cost-effective way to proceed. The benefits are huge and, as well as the practicalities, a cleaner Thames enables wildlife to thrive and leaves an environment for people to enjoy for generations to come. 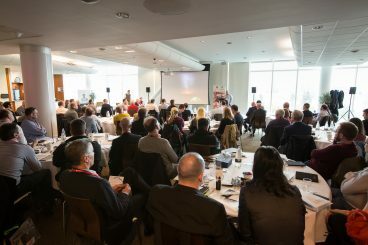 Adam rounded off the day by thanking everyone for attending with a reminder that the next big event would be GEO Business – with a seminar session organised by TSA on Equipment Theft (details here), and the TSA Conference scheduled for 6th November.